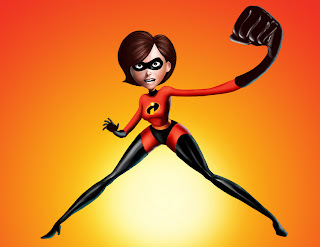 Elastogirl (sigh) how I love thee! Twitter was abuzz (well, a few of us were rolling our eyes at least) at a Jezebel article, bemoaning, amongst other things, the lack of strong female leads and role models in children's books. Here's the article in question and probably one of the first things you'll notice about it is the book (series) they're picking on. "OH NO!" says Steven Vallas PhD, citing a paper by sociologist John Levi Martin"A book that is 45 years old (I know this, because it was published the year I was born!) doesn't have any female characters in strong job positions, all the women are home makers, all the best jobs are taken up by males!" I've got some rather bad news for Steven Vallas and John Levi Martin. It's far worse than they think. For instance, let's take a look at Enid Blyton's "Noddy" series. Yes, it's an old book but where are the strong female leads - in fact why on earth isn't Noddy himself female? Would it not have had more of a positive impact if Big Ears was a kindly old spinster instead of a bearded gnome? Look at Rupert the Bear, boldly embarking on adventure after adventure asserting his maleness willy-nilly and offering no positive role model to all those little girls who still love him despite his extra bear-shaped Y-chromosome. Excuse my sarcasm and eye-rolling of course those of us (you) who love children's books know what a lot of rot the article is speaking. Picking over the most-loved and most popular children's titles pre-dating and published in the period from when those lovely Scarry books first appeared, you can't move for strong female leads, positive role models and smart female characters. You know, the ones Mr Vallas and Mr Levi Martin are trying to convince you don't exist in children's books. Any more for any more? Drop a comment below, thanks! Look, up in the sky, is it a bird? Is it a plane? No it's su...oh wait, no it isn't it's Eliot Jones, Midnight Superhero. By day he's a mild-mannered kid who likes to play with his toys and read books - but as soon as the clock strikes twelve he leaps into action, ready to right wrongs, rescue cats from trees and of course save the world! In this busy, energetic and frenetic book Anne Cottringer introduces us to the diminutive superhero and his knack for being in just the right place at just the right time. Coupled with Alex T Smith's hyper-busy panels packed full of fizzing detail, Eliot Jones makes up for his pint-sized stature by whizzing all over the place like a ginger-haired atom bomb. I love the retro art feel to this, and of course most children will love a superhero that doesn't spend all his time biffing baddies on the chin. A superhero who is a kid just like they are. Brilliantly paced and hugely entertaining. Charlotte's best bit: Eliot Jones E-stamped undercrackers! Daddy's favourite bit: Lovely retro artwork and an almost crazed energy to it. Definitely one to read to your youngsters when they're running around like mad things rather than trying to settle down before bed. In the deep dark wood, just as the sun starts to rise in the sky, Billy Monster is settling down for a well earned sleep. But Billy Monster is scared. Scared that something's lurking in the bedroom cupboard! Flipping the world neatly on its head, Alan Durant and Ross Collins conjure up a tale that may feel a little familiar to fans of Monsters Inc - but manages to be charming and funny enough to stand on its own two hairy monster feet. Poor Billy just cannot snooze while light streams in through the curtains, and every single noise from outside sounds like a horde of the most feared beasts ever to stalk the planet - CHILDREN! There are so many great little touches in this book that we enjoyed, and that's down to the combination of Alan Durant's amusing flip-switch on a situation parents know only too well, and also down to Ross Collins' brilliant and detailed artwork. Just don't have daymares, OK? Charlotte's best bit: The children's faces in the spread-panel towards the end! VERY funny! #readitmummiesanddaddies2013 - Are phonics any good to a reluctant reader? At times, the first faltering steps on the learning journey when a child is beginning to read lull you into a false sense of security. Children often learn at a blistering pace, so when a child suddenly loses all interest in reading themselves, what can you do? When this happens, the mere sight of a phonics book seems to provoke a negative reaction, and even if you try and sneak in self-reading in other forms (with traditional storytelling books etc), a child will often (horror of horrors) begin to disengage with those too. We are seeing this with Charlotte at the moment, despite a real love of books being read to her - and a real interest in books (thankfully, phew! ), she often feels under pressure when asked to read aloud herself so we're slowly cranking down a gear, and taking the attitude that gentle persuasion and patience, coupled with sticker-based rewards are having some impact and slowly encouraging her that reading isn't all work, work, work. There's no magic answer, but some experts are describing the national phonics initiatives as being partially to blame. The accelerated learning programme for children in reception, to be expected to at least have a basis in self-reading by the time they reach year one, means that both teachers and parents are under massive pressure to try and ensure that their child learns to read, decode and recognise - often neglecting to take into account that all children learn at a different pace in a multitude of different ways. Nelson Thornes Reluctant Readers / Fast Lane Readers - A handy collection of free downloadable e-books and resources to help children engage with reading outside of the often disjointed phonics experience. Any more hints and suggestions are most welcome, please leave a comment below. Our quest to catch up with the David Melling books continues - and we luckily spotted one we'd been wanting to read for quite a while at our local library. "The Tale of Jack Frost" is probably one of David Melling's best known Non-Hugless-Douglas books, due in no small part to a televised version of the story broadcast a few years ago. It's a delightful tale of a small boy, found in the forest by kindly creatures. No ordinary boy this, he has an affinity for cold and soon the animals dub him 'Jack Frost'. Jack lives a charmed life in the magic forest, as mythical creatures and the sheltering trees take good care of him and keep an eye on him - until one day the mischievous goblins become jealous of the magic entwined in Jack's forest home, and want to claim it for themselves. Thinking that a small child will be no match for the irresistible force of a bunch of greedy goblins, they vastly underestimate Jack's cunning and his own magic power - to freeze anything he touches. We've said it before in reviews of David Melling's books, and we'll say it again. No one draws mythical creatures better than Mr Melling and, coupled with a way of gently weaving a stunning story, it's not difficult to see why "The Tale of Jack Frost" is such a massive hit. Brilliant, and probably our favourite Melling book to date. Charlotte's best bit: Charlotte is completely and hopelessly in love with the unicorns! Daddy's favourite bit: Such brilliant, tiny, exquisite little details tucked away in each page. Always feels like a fresh experience with every read as you spot things you hadn't noticed before. Lovely! Back in February last year, we reviewed Anthony Browne's dark and disturbing tale, "The Tunnel" and I thought we'd never see a children's picture book that was darker in content than that. Of course, since then we've been catching up with the Shaun Tan back catalogue, and this book - "The Viewer" - visits such dark places and such 'grown up' themes that I thought it'd be an instant miss with Charlotte. Though The Viewer uses sparse text and a fairly loose story, describing a boy's obsession with his local junk heap and the discovery of a mysterious object - like a steampunk Viewmaster toy - triggers a journey into the deepest darkest heart of what makes us human. Disturbing as they are, the images the boy encounters each time he uses the viewer are addictive, compulsive, and soon even when he's not using the viewer itself, he's thinking about it - worrying and stressing over it. We soon find out why, as the story reaches its dramatic conclusion (which, of course, I'm not going to spoil for you). The depth of the messages here may well sail straight over your youngsters head, but they will undoubtedly be completely and utterly absorbed by this book - and will have a million and one questions triggered by the pictures and themes therein. By means of a frank admission, I did pick this book up for myself (Shaun Tan books are always hot properties at our local library so it was very rare to find one nestling amongst the happy jolly cuddly books) but was surprised at Charlotte's reaction to it. Talking to her about it, and what the ending meant (and indeed what she thought of the boy's folly as he gets ever more sucked into using the viewer) was a delight. In some ways, the discussions triggered by books like this help you get to know your child better than any other shared experience. Scintillating stuff. Daddy's favourite bit: A very strong and heady cocktail of fantastic visuals and spine-tingling tension. It won't be for every kid, but you may be surprised at how fascinating your child finds this book. Probably better suited to older kids (not because there's anything particularly offensive in it, more because of some of the themes it deals with) but try it on the little ones too and see what happens. We've been meaning to try and get hold of this book for what feels like forever. Penguin by Polly Dunbar instantly grabs your attention with its eye-catching cover, and once you start to delve into the story, you'll see why it's such a massive hit with parents and kids. Telling the story of a young boy who gets a mysterious present through the post one morning, he unwraps the package to find a penguin. A penguin that doesn't speak, doesn't move and - worst of all - doesn't play. Despite the boy's frustrated attempts to get the penguin to join in, Penguin just sits quietly and stares. Even when the boy straps him to a rocket and fires him into space. What happens next? We're going to let you find out yourself as this book is a rare gem, one that has your child (and you) hooting out loud with laughter as the deadpan penguin - such a brilliant character - resists all attempts to get him to join in. Well worth the wait! If you ever get the chance to check out Polly Dunbar's Long Nose Theatre Company productions of The Penguin or other plays, do so! If they're anything like the book, you'll be rolling in the aisles. Daddy's favourite bit: Just love the deadpan penguin! It's very easy to read too much into children's stories. Over-analysing them perhaps searching for a hidden agenda, or something woven into the fabric of a book that perhaps shouldn't be there. When Charlotte picked "Princess Fairy" up from the library stack I inwardly groaned. She has a huge range of diverse interests but is a real sucker for a fairy story, and as soon as I saw the cover of this I thought "Oh no, not a soppy girly story!" But ah my friends, how does the saying go? Never judge a book by its cover? Quite right too, and in this case I'd harshly judged this book before I had a chance to read it. It's very beautifully illustrated, and tells the tale of a young princess playing in her garden with her favourite toys and her beloved golden ball. As she bounces and plays in the garden, the ball slips through her fingers and splashes into a nearby pond. A helpful frog offers to rescue the ball, in exchange for a kiss from the princess. I know what you're thinking at this point. "Bog standard Frog Princess" knock-off, right? Wrong. The Princess refuses to kiss the frog, and in fact runs away - distracted by some other whimsy. But deep down it nags at her, that all the frog wanted was a kiss in exchange for rescuing her beloved golden ball. Amazingly the frog turns up on her doorstep, and by this time the Princess realises that she should kiss the frog and stop being an old meany. So she does, and the frog is magically transformed into...a fairy! A little girl fairy, very much like the Princess herself. All she really wanted was a friend. At this point you're probably shouting at me for giving away the ending of the book, because normally here at ReadItDaddy we try our very hardest NOT to spoil the endings or the surprises in books for you (we'll offer up the weak defence that it does actually give away the ending on the cover of the book AND on the Amazon listing for it). Without doing so though, it'd be difficult to explain what's different about this and why it gave me a little jolt and a moment of thinking "wait, did that just happen? Well that's certainly different!" Penny Dale's books are like the children's books of old, always beautifully presented and illustrated, always gently told. Perhaps though, seen through an adult mind we can't appreciate the innocence of them without thinking they're perhaps trying to push an agenda. It certainly triggered some interesting discussions once we'd read it ("Can girls marry girls then? Will the Princess marry the fairy?") because that's what happened in other versions of The Frog Princess. Charlotte's best bit: "I am the princess!" she said. But then changed it to "I am the fairy because fairies have wings and can fly!" Daddy's favourite bit: So utterly beautifully illustrated, the characters almost leap off the page. 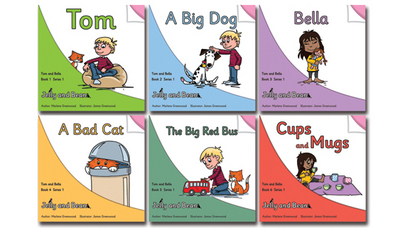 #readitmummiesanddaddies2013 - Spotlight on Jelly and Bean, a brilliant range of children's phonics books. We've looked at several valuable phonics resources already, some from large publishers and some from independent authors, illustrators and publishers introducing their own ranges of characters and books to help children with early stage reading. We were delighted to have the opportunity to look at the Jelly and Bean range of Decodable Phonic Reading Books, attractively priced with key stage structural learning developed to introduce children to reading through characters and situations they can easily identify with. The most interesting aspect of the Jelly and Bean range was Charlotte's reaction to them. Rather than instantly (and instinctively) knowing that they were 'learning' books, she was more willing to spend time with them on their own merits, perhaps because the characters (particularly Bella, a little girl very like Charlotte herself) were more readily accessible than some other phonics book ranges we've seen before. Developed by Marlene and James Greenwood at Jelly and Bean, the books fit in with all key stages of the early reading programme from the very first introductory and easily decodable letters and words, through to the more complex decoding, digraphs and high frequency words, and the troublesome (but sometimes magical) magic 'e'. As dizzying as the subject of children's phonics can be, and always with the firm advice that phonic progression is just part (albeit a very important part) of a child's learning and reading journey, it's great to see a high quality range such as the Jelly and Bean books making such an attractive and authoritative impact on UK phonics. Reading the testimonials on the J & B site from teachers and parents will give you an indication of how valuable this range can be to give kids exactly the sort of boost they need when early reading. Please visit the Jelly and Bean Website for the full range of books, prices and details on school ordering. Charlotte's best bit: A fun and approachable book series with characters and situations more easily digestible than some other early readers series. Daddy's favourite bit: Simple but fantastic book designs to keep kids focussed on the important bit - the reading, rather than proving too distracting with overly busy page layouts and illustrations. 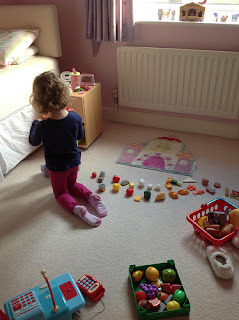 #readitmummiesanddaddies2013 - Phonics, phonics everywhere but which on earth to choose...? Even before Charlotte started school, she knew who Biff, Chip and Kipper were. We'd tried her with a few phonics books through the excellent Oxford Reading Tree programme, as well as tackling the brilliant My Phonics Kit, also from Oxford University Press. Using national phonics standards, the Oxford Reading Tree range deliver a more UK-specific phonics experience than many other programmes or resources - ensuring that the things your child is learning in school are backed up with the books, e-books, audio resources and web resources under the ORT umbrella. As well as the Biff, Chip and Kipper Books, OUP also publish the Oxford Songbirds Phonics Range, with none other than Julia (Gruffalo) Donaldson behind many of the stories on offer here. These are most likely to be the books your child is introduced to in Reception. As great as they are, we've often found that the stories are fairly hit and miss, often disjointed, and for Charlotte - a world away from the picture story books she's enjoyed over the last few years. So how do you somehow strike a good balance between school reading and learning, and reading for pleasure? We've tried 'gamifying' the exercises - backed up with exercises sent home from school like 'Tricky Word Bingo' (a process of matching and identifying words that can't be decoded by breaking them down by laying them out on lotto-style grids) and also a huge array of different literacy and phonics apps ranging from the very good (ABC Pocket Phonics by Apps In My Pocket Ltd) to the pretty atrocious (Topsy and Tim Start School). It's often very very difficult to find apps or audio that don't say "Ay, bee, see" rather than "ah, buh, cuh" so be very wary when buying or trying apps or other read-audio materials, that you're getting the standard that regionally is best suited and the best fit to what your child is learning in school. Ultimately though we've found the same thing many many parents have also discovered, that there really is no magic bullet and even the very best phonics programmes are not a solution on their own - that reading for pleasure and supplementary activities to aid and assist a child's reading are definitely required. 3) The mighty sticker chart. Once a child becomes disengaged from the 'reading to learn' process it's very very hard to get them back on track. Rewards like stickers and constant encouragement can help a lot - but in general trying not to 'speed the plough' too much also helps. Children learn to read at their own pace and trying to rush things can work against you. 4) Share book time with another child who is a stronger reader. Great if they have older siblings or slightly older friends who are willing to help out. 5) Pick out words and learning opportunities in the world around you. Road signs, logos on trucks, even a grit bin all have words on them. Helping a child to recognise, decode and read these can be satisfying to them and a good memory aid if they're things that are seen regularly. Compare those words to other words. 6) Rhyming text. Silly poems and rhymes stick in a child's mind, and can be invaluable. We've also collected together some great links to phonics resources below, many with plenty of free materials and worksheets to print yourself. If you have any more suggestions, please leave a comment below - we'd be happy to hear more from parents and teachers involved in and using phonics programmes and resources. In an accident, survivors always describe the moments up to the event itself as happening almost in slow motion. As if time somehow grinds to a halt around a cataclysmic event. In Eleanor Updale's latest novel "The Last Minute", time stretches out across 60 chapters like the threads of a complex tapestry. As voyeurs to the events preceding a huge tragedy in a small town, we are painfully and torturously placed in the lead car of a roller coaster ride that slams straight into a brick wall, full stop. 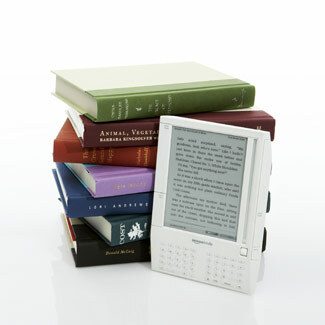 Books are often described as building tension towards a climax, page turners keeping readers on the edge of their seats. 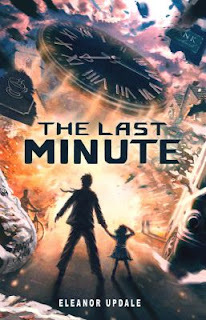 In "The Last Minute" we, as readers, follow each thread disjointedly with no choice but to hang on as Updale's almost documentarian storytelling hints at the impact to come. It's a tough read for a lot of reasons. At times, it's overwhelming trying to pick up the threads you're most interested in (and everyone will have a particular 'favourite' character or plotline they identify with - from an unfortunate man heading for a job interview, victim to several "Mr Bean" style accidents along the way to a toddler staring through the window of a coffee shop, fascinated by a digger working on the road). As the novel reaches the peak at which we feel like we should hold our breath, we already know that tragedy is close at hand so the book feels like it finishes on a low. This is not a novel to cheer yourself up with, this is a novel that radically demonstrates the sheer amount of contributing factors towards a tragedy, and how the fallout from it affects the people involved. I'd advise you to read the book first though. It's a really fast-paced novel that is virtually impossible to put down once you start to flick through. I did feel that the actual chain of events at the end of that fateful minute felt like they were skipped over, compared to the build up, but it's intense and interesting to read how the report tries to piece together the exact circumstances of the tragedy afterwards. Fascinating, chilling, gripping. Last year, we were fortunate enough to be included on the Red House Picture Book Awards Blog Tour, hosting a piece by Andrew Weale - author of this very book! Now we're finally getting round to reviewing Spooky Spooky House, thanks to the lovely Zoe at "Playing by the Book" for sending us a copy to take a look at. With a spooky haunted house, lots of 'reveals' in the shape of lift-the-flap bits, and monsters, ghosts, ghoulies and slime by the bucketload I thought Charlotte would love this and she did. I felt it was a bit...disapointing and I can't quite put my finger on why. Perhaps it was the constant 'tease' of the big reveal at the end (a heat-sensitive black panel which you have to 'warm up' to reveal the horrible character stalking the reader throughout the book - but in practice something we really struggled to get to work - we should've used Zoe's idea of getting a hot water bottle for the purpose, but used a hot radiator instead, OWCH!) meaning that story was sacrificed to be replaced by a sort of "are you scared yet? How about now, how about NOW?" type of thing as the running thread for Spooky Spooky House. There's an essay (or at least a very lengthy blog post) in what scares kids or what's deemed spooky. It's not purely about the visual, it's not even about the 'BOO!' behind a liftable flap. In Charlotte's case it definitely wasn't this book - because despite loving the theme and the reveals and the panel at the back (and of course the sinister stalking character), to her it was as spooky as a timid dormouse hiding in a teapot. Of course we don't exactly want to traumatise our children (particularly before bedtime) with nightmarish visions that will keep them awake all night, but spooky is as spooky does - compare and contrast this with the utterly superb (and quite similar) "Haunted House" by Jan Pienkowski. Charlotte's best bit: The big reveal. Once we got it working! Daddy's favourite bit: A Wham reference at the start of the book made me giggle. Since Charlotte began school, we feel like we've been snowed in by a swarming blizzard of phonics. It was quite surprising to see homework (HOMEWORK! FOR A 4 YEAR OLD!) being put in her schoolbag, but with the pressure for children to learn to read and attain numerical skills at an increasingly early age (even in Preschool if you read the latest recommendations), it's not enough to rely on (already overworked and put-upon) teachers to give your child that vital boost in their early reading skills. As well as the national curriculum standards, and a wealth of material supplied by school we've been supplementing Charlotte's early reading journey with a combination of print, electronic and spoken resources. Not because we feel that it's a race, a competition with other children (and parents) in her class, but because she really wants to learn to read and finds it a little frustrating at times when the phonics books or classroom texts are so vastly different to books she enjoys having read to her. Why is that, by the way? Even with some of the best writers (and illustrators) in the business contributing to programmes like the Oxford Owls / Oxford Learning Tree scheme, why are those books such a turn-off for kids when by rights they should love them just as much as "The Gruffalo" or "Six Dinner Sid" ? Supplementing Charlotte's classroom reading journey with things we've learned in phonics workshops at school, and also with things that worked for us way back in the mists of time when we were children do seem to have a direct effect but supplementing 'work' reading with 'fun' reading is essential. Over the course of the week we'll be taking a look at some of the ways of helping a child's literacy journey (just some, as there are so many different books, apps, sites and helpful resources - each seemingly with the same aim but at times with some dizzyingly different approaches) with a mix of stories, games and exercises that really can help. Whether you believe that reading aloud in class is useful to your child, or whether you believe phonics and decoding are worth anything at all, hopefully you'll find some new and exciting ways to get your children into learning to read and into books. For the second part of our "Book of the Week" nomination we are extremely pleased to finally be able to take a look at a book that has received a lot of positive buzz since it first released. Now launched as part of Nosy Crow's "Stories Aloud" range (with added enhanced audio, thanks to a clever little QR code tucked inside the cover) "The Princess and the Peas" is a delicious treatment of a well-loved fairy tale. Young Lily-Rose May is an ordinary everyday little girl who lives with her dad in a cute little cottage in the woods. She loves to draw, read, dance and do all the things little girls like to do. But she absolutely, positively does not like peas! This seems to be pretty common amongst little girls, but when a doctor calls to find out the cause of Lily-Rose's aversion to those poddy little green legumes, he can only come to one conclusion. Lily-Rose May is a princess - because princesses are allergic to peas! He shows Lily-Rose and her dad the well known tale of what happened when a princess, sheltering from a storm, stayed at the royal palace one night. The queen, seeking out a true princess to marry off to her son the prince (why he couldn't just go on Zoosk like everyone else is beyond me), hid a single solitary pea under a huge pile of mattresses. The poor princess could not sleep a wink all night, broke out in pea-green hives, and had a thoroughly miserable time of it. BANG! One Princess, ready to marry off to the lazy internet-dating-site-dodging prince. The doctor, rather than prescribing some antihistamines or pea-allergy suppressants, dictates that Lily Rose must give up living with her dad, and must move to the royal palace at once! This is a fantastically funny and very appealing reworking of "The Princess and the Pea" which Charlotte has demanded daily since it arrived. It could be a lot to do with Lily Rose May's name, it could be a lot to do with that absolutely stunning pink cover, but it's mostly to do with it being a brilliant book beautifully written and divinely illustrated. The audio enhancement is the icing on the cake (and we've already crowed (ha ha) about what a great idea Nosy Crow have come up with there). "The Princess and the Peas" definitely deserves a place in your pea-dodging princess' book collection! Daddy's favourite bit: Daddy's brilliant pea recipe ideas. You know, pea cookies aren't actually that bad! I make no apologies for banging on and on and on about this book since I first clapped eyes on it a couple of weeks ago, and you've probably seen enough tweets and references to it in the blog to have already guessed it was going to be a book of the week. But why? That's a very important question and one that's deliciously easy to answer too. It's the 'back of the neck' effect. "Maggot Moon' weaves a tale of schoolboy life around the time of the moon landings with the delicate golden threads of surreality. The hero, Standish Treadwell, is no ordinary boy. He's dyslexic (like Sally herself) and to him, time is not the linear uniform notch on the bedpost of life that we all experience on a daily basis. As we see the world through Standish's eyes, we begin to understand more fully than ever before what it is like to be dyslexic, and to genuinely feel that 'normal' is almost an offensive word. From his perspective, we feel that 'normal' is in fact horribly broken and disjointed, and in the case of his view of authority and conformism, 'normal' is inherently dark and dismal. Sally Gardner's prose as she takes us through the obsidian journey through Standish's life and his mind is so wrought with tension and gripping drama that you'll begin to understand why it needs to be shouted about. At times, reading "Maggot Moon" reminded me of the same feeling I got watching a fantastic piece of Japanese animation called "Tekonkinkreet" - the 'back of the neck effect' that makes you feel like your mind is about to explode with the possibilities of a world where reality is surreality. 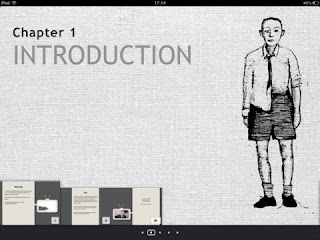 With the enhanced edition, Sally Gardner has worked very closely with the iBook developers Hot Key Books to ensure that we do not merely experience another dyslexic character who can't read or spell, can't write, and can't effectively convey their message. We experience a character (and indeed the story) in a way that puts us right behind Sally's eyes (and Standish's for that matter). The iBook version can be read straight (in portrait mode) but flip the book on its side (like Standish flips the world in his mind) into Landscape mode and you'll experience the true magic that happens when a developer starts to unleash the potential of technology. 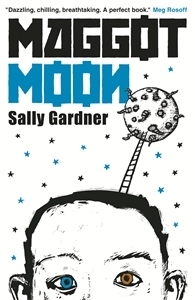 "Maggot Moon" is packed with extra information, accompanying readings and videos of Sally herself explaining her thoughts and processes. There are illustrations and ties into social media, and some truly awe inspiring showreels about the power of information and the way our modern methods of communication (specifically the internet) can begin to shape our life experiences in ways no one could have possibly predicted when the fledgling world wide web first appeared over 20 years ago. Even if you've already read Maggot Moon in hardback or paperback printed form, I'd urge you to pick this iBook enhanced version up to experience the story in an entirely new - and most importantly - an extremely inspirational way. I know Hot Key Books have a lot of juicy projects in the pipeline - if this is anything to go by, they may well be one of the most influential and cutting edge ebook developers on the planet at the moment. Brilliant, terrifying but thoroughly essential. Drop by the Maggot Moon iBook Website and grab a copy now! Being small can be annoying sometimes. People barge you out of the way, you always struggle to find clothes in the petite section - and even the simplest action like tying your own shoelaces can be a bit of a pain. Thankfully there are also lots of advantages to being small, as the delightful little rabbit in Louise Yates' book "A Small Surprise" expertly demonstrates. You can hide practically anywhere. You can fly through the air with the greatest of ease, and you can win the love and respect of animals that could probably swallow you whole without needing a glass of water to wash you down. The terrifying crocodile, the powerful gorilla and the ginormous giraffe! What we love most about this book is the flow. The story effortlessly sails from page to page as the tiny rabbit dashes around with such frenetic energy that you'll feel worn out by the end of the book. Normally we're not great fans of the slightly disjointed text formats this book has, but Louise seems to have a knack of making a book feel like an enjoyable journey, so when we get to the (rather funny and cheeky) conclusion, we feel like flicking back to the start and beginning all over again! Wonderful and effortlessly charming. Look out for it! Charlotte's best bit: Rabbit being swallowed whole. That's a really cool trick! Daddy's favourite bit: Rabbit's final hiding place. Eeek! Spotlight on Springboard Stories Issue 3 - Food! Monkeying around with food in Springboard Stories Issue 3! Once again we're extremely grateful that Springboard Stories have let us take a look at their fantastic packed-to-the-gills magazine, filled with brilliant ideas, discussion and stories. This issue revolves around a subject very dear to my heart, food and creatures very dear to Charlotte's heart, monkeys! Dipping in, there's a brilliant retelling of the ancient Chinese "Monkey" stories. For those of you who grew up in the 70s and 80s and can only remember "Monkey" as being that funny little guy who rode around on a cloud and biffed baddies with his stick, it'll be a revelation. 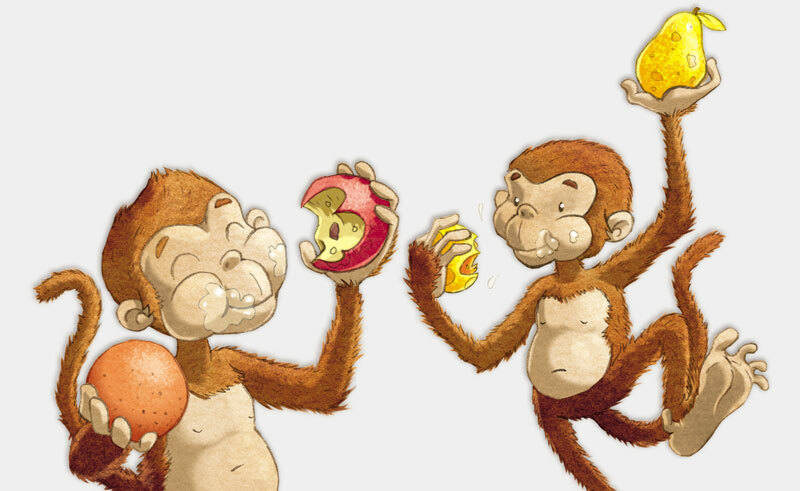 Debjani Chaterjee's version of the story revolves around Monkey being extremely naughty while trying to worm his way into the King's royal fruit gardens. With illustrations once again by the very talented Walmesley Brothers (Simon and James), it's a great story to share with class before examining the various monkey-based activities that accompany this delightful little book. Look out Waitrose, you've got some competition! 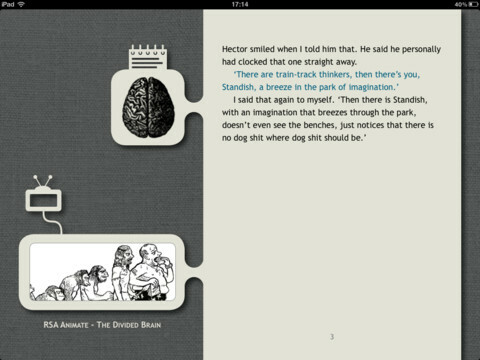 One of the main reasons we like Springboard Stories' publication is that there are so many triggers for talking points. Not just with children but with other adults (particularly the wonderful book folk I am lucky enough to be in touch with on a daily basis). The Monkey legend was a particularly popular topic this week, examining the various ways the legend has been adapted and 'westernised' over the years - from Damon Albarn and Jamie Hewlett's big budget West End stage production of "Monkey: Journey to the West" to the popular videogame adaptation of the legend (Enslaved by Ninja Theory). It was great to see the 60s animated version getting mentioned, as this is probably one of the most powerful and faithful versions of the stories. There are sumptuous images from that version to enjoy throughout the magazine. If you're a teacher, librarian or interested in child literacy, numeracy and of course wonderful wonderful books and you've yet to experience the sheer wealth of information and activity ideas on offer in Springboard Stories, drop by their website and check out their subscription rates and the wealth of free material they offer in addition to the magazine. Daddy's favourite bit: Some brilliant artwork spreads (Springboard's posters in every issue always end up on the wall or the pinboard!) and fantastic activity ideas. A metric ton of fabulous and inspirational activities. I just don't know how they manage to pack so much in! 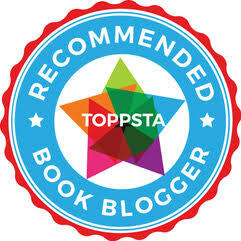 #readitmummiesanddaddies2013 - When Print and E-Books collide to make something even more awesome! Detente is beautiful, isn't it? Whenever we see the subject of the 'great war between print and digital' coming up in discussions, we like to think about the middle ground in this imaginary conflict. You see, there are ways that both formats can coexist side by side, complimenting each other as deliciously as a blob of cream floating in a cup of really good strong coffee. We've already discussed the 'enhancement' of books available in print, but two other aspects of digital meeting print are becoming more and more interesting as technology becomes cheaper, more readily available and more widespread. For instance, most people (myself only just recently btw) now have a smartphone, a handy pocket device capable of organising their lives, communicating with friends, allowing a bit of downtime with some games and distractions - but did you know your smartphone can turn your book into an interactive experience? It's a very exciting idea and Nosy Crow are constantly looking at ways for print and technology to meet. Often Nosy Crow books are published along with apps and accompaniments to offer additional activities as a 'leap off' point from enjoying a picture book. Moving on from QR codes to something slightly more science-fiction-like, developers and publishers are harnessing the power of tablets and netbooks to 'see' books in an entirely different way, even blurring the lines between the real world and the book world. Augmented Reality is a term that has been around for quite some time, particularly in videogames. With a simple camera to read (and sometimes even map in real time) an environment, players can see themselves on the TV screen holding game objects and seemingly manipulating them to further their progess. Coupled with motion controls, Augmented Reality's potential for immersion and involvement is massive. For print books, having an augmented reality enhancement could work in various ways, letting characters seemingly leap off the page and run around on your tabletop as you read. Though AR is still in its infancy, for a child there is something quite spectacular and magical about seeing an AR-enhanced game in action so imagine what it would be like if more books used AR to bring printed works to life. "The Fantastic Flying Books of Mr Morris Lessmore" is a title that uses an accompanying augmented reality 'app' (called the Imagine-o-tron - developed by Moonbot Studios) on the iPhone and iPad to offer just such an experience. If you have the book, you can download the app for 69p to provide realtime enhancement of the printed story (which you have to buy separately of course). 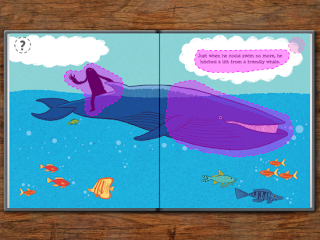 The app 'scans' the pages using an iPad or iPhone's camera, and brings the story to life - and also offers children the chance to directly interact with the printed page elements too. Like 'Stories Aloud' this is also a brilliant example of the potential of mixing book and digital in new and exciting ways and something we'd love to see a lot more of in future. It's certainly a brilliant way to increase the readability and the 'shelf life' of a book, so here's to more in 2013 as these truly magical ideas can really involve children who might otherwise find books stale and boring. It's officially "We Love Hugless Douglas" week for Mr Melling but having missed out on all the hype, we thought we'd quietly take a look at our favourite DM book (at least our favourite that he's both written and drawn), The Kiss that Missed. One night, at bedtime, a king speedily and rather carelessly blows a kiss to his little boy - but ohhh calamity, it misses. The kiss flies through the window, and the king dispatches a brave (and slightly inept) knight to track the rogue kiss down and bring it back. As we read this book, Charlotte enjoyed 'chasing' the kiss throughout the kingdom as it slowly weaved its way through the deep dark forest, turning slavering howling wolves into big soppy cuddly ones, or stopping a mythical dragon in its tracks. The message is rather brilliant here. Don't rush bedtime, snuggle down with a bedtime story, and kiss your children goodnight - don't let your kiss miss! As ever, I'm completely green with envy at Melling's ability to draw such perfect characters and weave such an involving tale. I keep hoping this will get the same treatment as Jack Frost (ie end up as a great little animated TV feature) but in book form it's nigh on perfect for bedtime reading. Mwahh! Charlotte's best bit: The big soppy bears and bunnies. Daddy's favourite bit: Great tight penwork and superb characters, the sort of thing we've come to expect from Mr Melling. Top stuff! Wash it down with a cup of cold sick!" I thought I'd just share that with you, because if you've got a soon-to-be-five-year-old at home they'll probably find that hilarious, and will endlessly repeat it to you for the rest of the day. I apologise but if they liked that, they'll most certainly like "The Grunt and the Grouch" by Tracey Corderoy and Lee Wildish. Gross books are like nectar to kids, and the grosser the better. In this story The Grunt is a rather antisocial monster who likes living alone, but now and again likes to go and cause mayhem and havoc in his local town. He's smelly, he's dirty and his idea of haute cuisine usually revolves around mouldy gone-off things. So when he comes home to find a party invitation on his doormat, the Grunt is less than pleased. He's even gruntier than ever when he finds The Grouch camping out in his garden having a fine time with the world's grimiest picnic. Over time, the two become friends but just as The Grunt starts to really like The Grouch he leaves suddenly! Oh no! For once, the Grunt is a bit lost and misses his new-found friend madly. Will the two be reunited? This is such a fabulous little tale, full of squelchy squirty stuff but ultimately with a rather touching message underneath that layer of slime. Beautifully told by Tracey, who is fast becoming one of our favourite children's writers (and is an absolute STAR on Twitter btw) and superbly illustrated by Lee, it's the first in a whole series of Grunt and Grouch books so keep a bloodshot eye out for them, they're excellent! Charlotte's best bit: The Grunt's perfect breakfast. Ee-ewwwwww! Daddy's favourite bit: Ahhh you can't help but love a bit of grossness. I love these two, they're like Morecambe and Wise, only slightly stinkier and more prone to wiping bogies on each other! Bless! As I type with my fingers practically falling off with the cold (our heating is broken again! Gah!) I can only imagine what it's like to don a wetsuit and dip into the beautiful warm and teeming waters of a Hawaiian reef. Thankfully we were given the opportunity to live vicariously through the world of great books thanks to Monika Mira and her range of wildlife and marine books, published by Lucid Hawaii Inc. Good non-fiction books seem to be something of a lost art, so it was an enjoyable experience dipping into several of Monika's titles, ranging from the Hawaiian Reef Fish Colouring book (an award-winning best seller, letting children colour in a range of tropical fish and underwater scenery from the blue waters around the Hawaiian Islands) to more topic-specific books like Hawaii's Green Sea Turtles and Fun Fish Facts for Kids. If your children or class are looking at marine life, check out the Lucid Hawaii website for a stack of brilliant resources and fishy facts to trigger activities and discussion about the diverse wildlife living under the sea. My Nan (Charlotte's great nan) is a witch. We have known this for some time now, and it stems right back from being at school and her eerie insider knowledge of what we'd be having for school dinner, her deep love of cats and bats and lots of other creatures, and her uncanny ability to predict the weather. She loves a good steaming cauldron of broth, she doesn't wear a pointy hat but has been known to wear a dazzling tabard or two and rather than riding a broomstick she used to terrify drivers riding around on a Norton 500 (which, at times, I'd cling to the back of, scared out of my wits). We love her though. She's 91 and as sharp as a tack. In 'Hubble Bubble Granny Trouble' Tracey Corderoy and Joe Berger celebrate 'different' grannies everywhere. You know the ones, they don't like cardigans, they definitely do not like bingo but they love being slightly subversive, dressing differently and they know EVERYTHING! A little girl thinks that her Granny could do with a bit of a makeover, to be like everyone else's granny and so she whisks her into town for some new clothes, a new (more cuddly) pet, and a seriously sharp hairdo. Alas, it turns this wonderful witchy granny into a plain and boring one, so when the little girl calls on her one morning, she finds her tucked up in bed with no joie de vivre. Can the damage be undone in time? Beautifully presented and produced by Nosy Crow with a great innovation tucked inside the cover - a QR code you can scan with a smartphone or a tablet PC, to hear the story read aloud to you (A fantastic idea we'd definitely like to see used more and more). We really hope we see more of this dynamic duo! In the meantime, give your granny a big cuddle if you can. Grannies are special! Daddy's favourite bit: A superbly entertaining tale about standing out and being different, and how that's a VERY good thing! Yay for grannies! Marjane Satrapi's books and graphic novels are mind-blowing in concept and design, so it was really great to discover her gem of a children's book nestling in the library stacks. "Monsters are afraid of the Moon" starts off with three rather nasty monsters and a poor little girl. These monsters are not cuddly, they're not in the least bit friendly and they're making Marie's life an absolute misery. Every time she settles down to sleep, the monsters wake her up, pull her hair, mess up her bed and are generally horrible, horrible, HORRIBLE! Marie is at her wits end, so she comes up with a rather clever plan to solve her problem. She grabs a giant net and kidnaps the moon! With the moon safely glowing in the corner of her room, the monsters are kept at bay - because Monsters only come out when it's pitch black. Naturally stealing the moon has an impact on everyone else. Soon the neighbourhood cats are ending up in casualty as they stumble around and bump into each other without the moonlight to guide them. Marie doesn't know what to do, but the king of the cats comes up with a genius solution! We won't ruin the end for you, but this fairly rare book is an absolute delight (despite a bit of a scary start). Marie is brave and it's actually a refreshing change to have monsters acting monstrously in a book. Sublime stuff, seek it out if you can. Like all Marjane's books, it's fantastic. Charlotte's best bit: Even though they're scary and nasty, Charlotte STILL likes the monsters. Daddy's favourite bit: Marjane Satrapi brings her graphic novel expertise to bear with some brilliant artwork and tense storytelling, all in the space of a few pages. A masterpiece! This week's theme for #readitmummiesanddaddies2013 is dipping into technology, and the various ways that new portable devices such as tablets and netbooks are changing the way children enjoy stories. Some time ago we covered a rather innovative app called MeBooks by MadeInMe, a company that produces engaging apps to stimulate a child's love of stories and plays. MeBooks is one of a brace of storefront-led storybook apps but what makes MeBooks stand out is the ability for parents and children to customise the stories themselves. 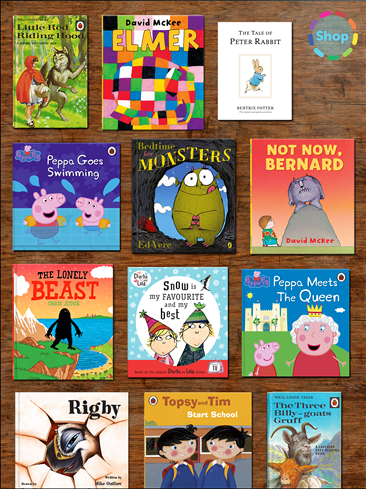 Though most MeBooks are beautifully read by a host of celebrity readers, the fun begins when parents sneakily have a play with the app while their children are tucked up in bed, and record their own dialogue (and silly voices of course!) over a child's stories. Equally enjoyable is working your way through a book together, taking it in turns to read and record the story as you go - eventually playing it back or even saving it for later. The store works particularly well, and has a brilliant selection of books both old and new (including some of our all time favourites like "Not Now, Bernard" by David McKee and the sublime classic Ladybird children's fairy tale books, complete with all that lovely lovely painted artwork. To get you up and running, you get a book for free with optional in-app purchases for the other titles. Depending on your point of view about paying for e-books these aren't too unreasonably priced so you can soon build up quite a library of brilliant stories to share, read, record and enjoy. We're starting to see more and more instances of 'customisation' in e-books and storytelling apps and we firmly believe that if you can let a child and their parents 'own' a story in some way, putting their personal stamp on it, it feels all the more enjoyable and truly 'theirs'. Apps that allow children to make up their own stories are equally welcome, particularly when an app gives children the assets they need to start building a story or even an interactive play without needing artistic skills and expertise. We've seen quite a few apps like this but the standout is definitely Top That Publishing's 'The Froobles'. Again, available for free with optional in-app purchases, the free version is absolutely packed full of potential. 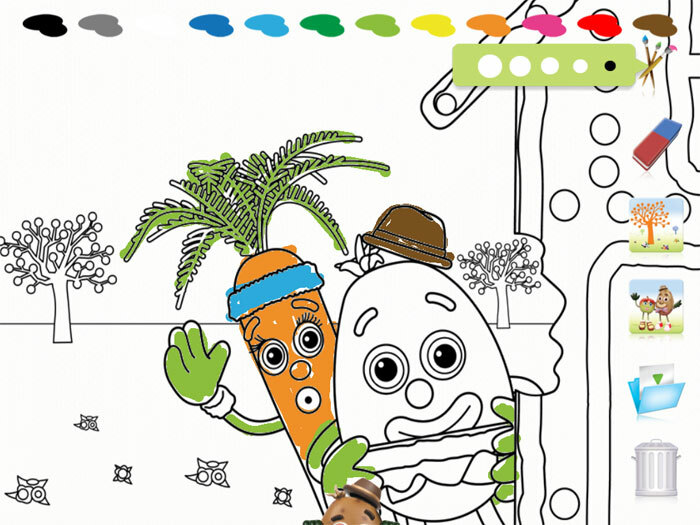 Seen here is the 'make a play' part of the app - which is by far our favourite bit of this feature-rich app. 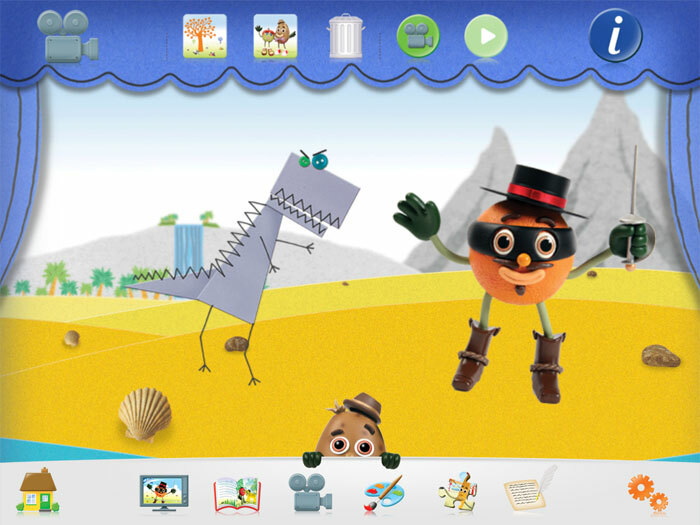 Children can choose a scene, choose their favourite froobles characters and start recording short movies (complete with speech and sounds they add themselves) to tell a story. Once they hit the record button, they can move characters around, and act out a scene - then save it for later playback. Charlotte can literally spend hours with this and it's so easy and intuitive to use that she can even be left to her own devices while playing it. 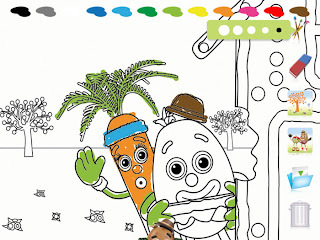 The app also contains a great selection of entertaining stories featuring the Froobles gang, as well as other activities like colouring and drawing. The Storybook app market is exploding at the moment, but in our next article we'll be looking into (perhaps not so) dim and distant future, and how new emerging technology may offer new and exciting ways to engage children and parents with reading using their favourite gadgetry. Please take a moment to hop over to The Library Mice blog for a fantastically written piece on 'The Gift of Reading' which was written to support the #readitmummiesanddaddies2013 campaign to get more parents reading to their children. It beautifully underlines the things we clamour frequently about on ReadItDaddy, specifically those precious moments when you have a child's attention and are reading them a story that spurs their imagination and makes them want to hear more. As Mel over at The Library Mice points out, the hardest 'sell' are parents who have yet to experience that 'wow' moment. They're a tough crowd and if we can reach them with this campaign, it'll be worth all the effort and time and then some. Just watch the video on the article to see true brilliance in action. A brilliant post from a blog that consistently makes our jaws drop. Top work, Library Mice! Back when we ran an article on how to write the 'perfect' app or e-book for children, we concentrated on various elements that can make or break a successful app. We were given the chance to take a look at Playfuel Ltd's "Goldilocks and the Three Bears" - a new e-version of the classic story. Playfuel are a small start-up aiming to produce high quality e-books and storytelling and this is their first published app. Straight off the bat we were very impressed by the artwork, and the story enhancing music and sound effects. For an e-book or app developer to truly stand out, these are the important foundations to base an app on. EDIT - Now the app has had its user interface tweaked, clear arrows at the sides of the screen show you exactly where you need to 'touch' to progress through the story. I would probably have made more of the fact that certain objects in the story can be interacted with (touch the bowls of porridge and the beds etc to see what happens!) but kids do naturally tend to find this out for themselves if they're familiar with how e-books and story apps work. Some great touches in this like bouncing up the stairs and we particularly liked the 'build baby bear's chair' bit too. Daddy's favourite bit: High quality art and sound, and so much better now the UI has been updated! Go geddit! There seems to be a war raging between the luddites and the technocrati and it's a war that seems as odd as any other war. Two sides are gathered, with a fair amount of neutrals in the middle, claiming that their favourite method of enjoying stories is better than the other and will somehow 'win'. As we know, in a war there are no winners and what this has to do with the #readitmummiesanddaddies2013 campaign is this. Quite simply, there's more than enough room on your shelves and in your tablet / kindle / e-reader for both Print books and E-books. This week on ReadItDaddy we're going to be focusing on some of the best e-books around and some of the publishers who fully understand the statement topping this article - that 'E' doesn't just stand for 'Electronic' it stands for 'Enhanced'. The Maggot Moon introduction in 'Enhanced' mode. Hello Standish! We start to see Maggot Moon how Sally herself sees the book. You see, Sally is Dyslexic and working with Hot Key Books has developed several rather clever methods to show readers how the book and how text appears to her. There are some truly fascinating insights and interviews with Sally, as well as a whole host of supporting materials that pop in and out of the story - from amazing pieces of art to support the story itself to subversive video clips that show us how powerful the internet can be at generating memes and hype. With E-Books, we usually hear the plaintive cries of folk claiming that they are too expensive, and that surely the cost of digital distribution and the lack of cost involved in bringing a book to print means that e-books should be cheaper. But when you consider how much effort is put into something like Maggot Moon, and how close in price it is to the paperback version, those arguments seem a bit odd and out of place. There's also the argument that enhanced books aren't great for children, distracting them too much from the story and the narrative. I'd agree in some respects with this but again this seems to be an argument squarely aimed at books that pad out their content with games and other distractions, rather than enhancements to the story (as with Maggot Moon). They can actually help children listen to a story if parents aren't confident readers, and can also give additional information and leap-off points for children to go and investigate once the 'book' is closed. You'll hear more about the Maggot Moon Multi-Touch Enhanced Edition in our review later this week, but in the meantime here's a list of children's books that have also wowed us and shown us how 'enhanced' editions really can help a child engage with books in new and very exciting ways. If you have any other suggestions, please do drop them in the comments section below. Maggot Moon (Multi-Touch Enhanced Edition) for iPad is available on the iTunes store. The Fantastic Flying Books of Mr Morris Lessmore (Moonbot Studios) and the Imagine-O-Tron app to enhance the print version of the book. Now and again I sneak off and read books that are most definitely 'Daddy' books and not 'Charlotte' books - though as soon as she can read I'll be letting her take a look at "Wonder" by R.J. Palacio. For a child starting school for the first time, it's scary enough. When you look like August does, it's a terrifying prospect and though he shows a great deal of maturity and begins to make friends at Beechdale, things aren't always as they seem. 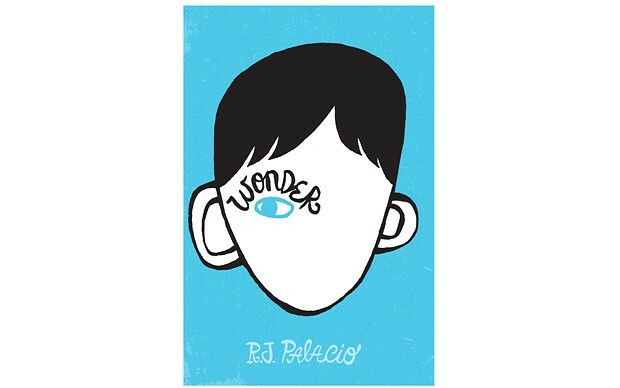 "Wonder" is beautifully written, tackling the story from several character's perspectives (for instance, showing his sister's view of how August's deformity affects the family's life, and how his real friends see him and are affected by him too). I love the great 'geeky' references in this as we find that August is pretty amazing and just like other boys he's obsessed with Star Wars, difficult with girls, smart and funny with a great deal of intelligence and maturity. "Wonder" reminded me of the dark side of school, when bullies attempt to win popularity by running down the underdogs or picking on kids who can't get authority to understand what's going on and can't get help. August overcomes each obstacle (with a little help from some brilliant friends along the way) and his story bears a message that all of us can learn - don't take anyone at face value, unless you get to know them you truly cannot 'know' them. It's a rollercoaster ride at times, but "Wonder" is a fine example of how writers can tweak our emotions and empathy as we get to know their characters and situations and almost feel part of August's extended family as we see his life from top to bottom. A thoroughly good read and heartily recommended. As I said at the top of the review, this is something I'd love to let Charlotte read when she's old enough and I seriously hope that schools recommend this book to children, we can all learn something from it. 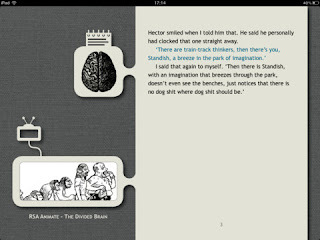 Daddy's favourite bit: The 'Lobot' ears (August's hearing aids) and the fantastic end-quotes from the school yearbook.